Make your field trip a valuable learning opportunity by including a unique Field Trip Experience! These brand new standards-based programs are led by experienced Zoo educators and last 45 minutes so you still have time to see the Zoo. 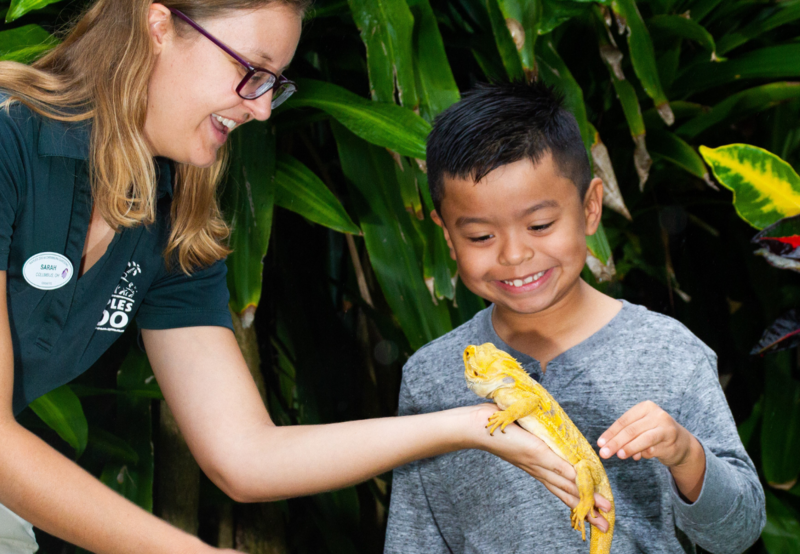 Programs include interactive STEM lessons and an education animal encounter all while learning about Naples Zoo’s residents and protecting wildlife in southwest Florida and around the world. Join the Ocean Rescue Squad! Through hands-on activities and water demonstrations, students will explore the impact plastics have on animals. Students will become part of a rescue team as we conduct mock animal dissections to save them! Students will explore how plastics move through the watershed to find out how easy it is for plastic and other trash to end up in the ocean. Students will practice their observation skills by using their senses to explore the outer coverings of different animals and plants. How does an animal’s outside help it survive? What do plant leaves feel like? Students conduct simple experiments to explore how different outsides help with different needs. They will also use their creativity to make plant and animal rubbings. Standards: VI.A.1.a.- b., VI.A.2.a., VI.B.1.a. How do you measure up to an animal? Are you as tall as a tiger? Are your hands as big as a black bear’s paws? Students will use non-standard measurements to discover the diversity of animal size and how their sizeable features stack up for survival. Explore with us as we look at how plants and animals can look wildly different! Students will test their skills to see how well they can match up animal babies to their parents, and learn how there can be variations within whole populations. Do all giraffes look the same? What about zebras? Come find out how all animals are truly unique, just like you. Explore animal behavior as we take a look into the lives of animals over one year’s time. How do seasonal changes require a change in an animal’s behavior or physical characteristics in order to thrive? Students put their engineering and problem-solving skills to the test as they build structures to address real-life scenarios. If you could create your very own zoo, how would you organize it? Through investigating and rearranging, students will take a close look at how Naples Zoo animals are grouped. They will take on the challenge of grouping animals in many different ways using their understanding of animal classification and life stages. Students will earn their detective badges with this “escape room” style program as they follow clues and investigate some mysterious happenings in the swamp. Learn how environments can change and how animals must learn to adjust or move out. Join us as we dive in and take action to keep these habitats safe for all plants and animals! *One adult for every 10 students is free, additional adults are $12. Minimum 10 paying students required.